Wash & cut gherkins into 4 pieces (if small cut into 2 pieces). Add mustard seeds, when it crackles add curry leaves. Add onion saute till golden brown. Add tomato saute till completely cooked. Add gherkins stir for 1 minute. Add sambar powder stir for 2-3 minutes. Add water bring it to boil. Add salt, stir & close the lid. When water is almost evaporated & only little water remains. Add coconut & coriander, stir & lower the heat till water evaporates completely & becomes dry. Gherkins Stir Fry is ready. Garnish with mint leaves & serve with roti, chapati or as a side dish with rice sambar. yummy stir fry..I too have this tindora in my draft but a different style,will post soon..
Love tindoora .. curry looks yummy. Simple but yet a delicious stir fry..love with some rice and rasam.. This goes great either with flatbread or with rice! Yummy! 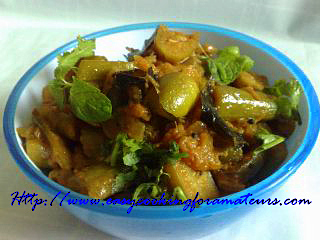 Making tindora with sambar powder sounds like a yummy idea. I usually do a simple stir fry with onion and coconut. Your version sounds more delicious!